Thanks to a couple pointers and archived copies which were received by E-mail, we finally have some nice additions to the post that was published just hours ago. The following series of messages should hopefully illustrate the serious problems that the US Department of Justice is facing and particularly its poor handling of Microsoft’s abuses. The following is a copy of a letter by Scott Fulton, written at the time of the DOJ case against Microsoft. Highlighted in red are bits that are related to Novell. and has been cleared of viruses. wish you the best of holidays. No. 98-1232, and New York v. Microsoft, Civil Action No. 98-1233. ”Microsoft’s conduct as a corporation and a manufacturer of computing products, is predicated upon an internal policy of deception, which includes deceiving customers, deceiving competitors, deceiving partners, deceiving its own vendors, and at some level, deceiving its own staff.“I know Microsoft, and I know my industry. I thoroughly comprehend how Microsoft’s products, agendas, and conduct have shaped and defined computing as we know it today. I have friends and colleagues who work at Microsoft, and I have others who work with its current partners, its former partners, and its direct competitors. Having read Judge Thomas Penfield Jackson’s Findings of Fact in the civil matter as rendered 5 November 1999, and having shared my opinions at length with others directly affected by those Findings since that time, I can state without hesitation that there is nothing in those Findings to which I take exception, or about which I personally can find any reason to disagree. I call your attention to the fact that these Findings of Fact were given deference by the Court of Appeals, despite that certain elements were called into question, and despite the disqualification of the judge. The Appeals Court’s thorough study of the Findings of Fact, as well as the other evidence in the case before the District Court, uphold a quintessential truth whose importance transcends any scrutiny of judicial misconduct: Microsoft’s conduct as a corporation and a manufacturer of computing products, is predicated upon an internal policy of deception, which includes deceiving customers, deceiving competitors, deceiving partners, deceiving its own vendors, and at some level, deceiving its own staff. enterprise originally championed by Joel Klein and Janet Reno. legitimate shortcomings, wild notions, and simply wrong ideas. industry now is as it should be. ”The company’s chief executives not only tolerated but helped foster this new approach, like “dungeon masters” in a role-playing game encouraging nastier self-characterizations by players who deemed themselves “evil.”“Once it became a monopoly as early as 1988, Microsoft’s executives almost immediately adopted a Watergate-style cloak-and-dagger approach to its internal corporate and even personal conduct, to the extent that some executives were privately relishing in the opportunity for them to emulate Nixon’s “plumbers,” or characters from “The Godfather,” or anti-heroes from comic books, or even leaders of the Third Reich. The company’s chief executives not only tolerated but helped foster this new approach, like “dungeon masters” in a role-playing game encouraging nastier self-characterizations by players who deemed themselves “evil.” Before the company had actually violated the law, Microsoft’s executives were adopting other-worldly roles, imagining themselves as saviors of the world but rebels against the establishment, immunized from the laws that apply to mere mortals. It was this immersion in this surrealistic fantasy vision that empowered Microsoft not only to commit its undisputed violations of antitrust law, but also to defend its conduct to this very day as somehow fair, honest, innovative, and pro-competitive. today, little evidence of it remains outside of this article. tangible value in any currency in which common people trade. created for that specific purpose alone and no other. ”We need to start thinking about Novell as THE competitor to fight against — not in one area of our business, but all of them.“We need to start thinking about Novell as THE competitor to fight against — not in one area of our business, but all of them. eventually find a way to hurt us badly. serves much of a warning [...] What is the guy supposed to do? he has to buy for in the office. my proposal is to have bambi refuse to run on this alien OS. comments? broadly and conclude we are doing it for Windows? will make judgments against it without knowing details or fats [sic]. very sketical of us so one slip up and we get set back quite a ways. 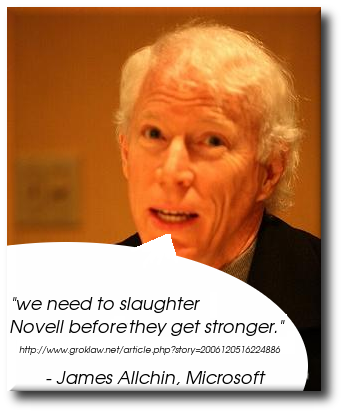 need to smile at Novell while we pull the trigger. no need for a DOS once Windows 95 was installed. were its own brand name. definition of the product/concept/marketing scheme. functionality and productivity beyond basic HTML document sharing. existing investments in OLE and DCOM technologies. Working Group had become a non-entity. a trickle. The death spiral still worked. ”Microsoft’s private fantasy world has evolved into a dangerous corporate subculture whose principles and motives threaten the very way business is done in America, in Canada, in Asia, in Europe, and anywhere there is a microprocessor.“Within the locked, sacrosanct confines of corporate headquarters or boardrooms, no fantasy world is illegal. Corporate fiefdom or chivalry may assume any degree of distortion, and black may very easily be declared white without objection. It is when these bizarre practices lead directly to tactics of deception, sabotage, and bad faith against not only a company’s competitors but also its purported partners, and to a calculated campaign of consumer choice control, that they impede upon the rights of individuals, of companies and corporations, and of an entire industry. Microsoft’s private fantasy world has evolved into a dangerous corporate subculture whose principles and motives threaten the very way business is done in America, in Canada, in Asia, in Europe, and anywhere there is a microprocessor. ”To this day, serious bugs and deficiencies in Microsoft’s operating systems and applications, discovered by myself and others and duly reported to Microsoft, remain uncorrected, quite possibly for fear of the political cost of exposing the problem by making the world aware of its solution.“When faced with a situation where the only rational option is for Microsoft to solve its own problems, Microsoft chooses instead to go on the attack against some outside enemy that could potentially expose or spotlight those problems. As a result, those problems may never be solved, but the enemy du jour becomes so damaged that the continued existence of those problems in the context of the industry as a whole, becomes inconsequential. To this day, serious bugs and deficiencies in Microsoft’s operating systems and applications, discovered by myself and others and duly reported to Microsoft, remain uncorrected, quite possibly for fear of the political cost of exposing the problem by making the world aware of its solution. a damn what you think. interdependence between the enemy and us. different and we own the territory. Windows operating system as platform software. it–essentially, any software that isn’t Windows. into Windows, thus narrowing the feature set of “middleware” at will? for a reasonable period of time. files are non-specific to Windows or Macintosh or Linux. publicize their own phone numbers, and you get a glimpse of the idea. ”Microsoft is actively working to demonstrate this principle, and we must see .NET not only as a good idea, but a warning. As long as we consider Microsoft the de facto keeper of the computing dictionary, we will render that company of changing its terms–and to some extent, our lives as a result–on a whim.“The architectural concepts underlying Microsoft’s .NET architecture are among the best ideas the company’s developers have ever conceived. Nonetheless, the mechanism is being put in place today for Microsoft to change the rules yet again. Microsoft itself has stated in press conferences throughout the antitrust proceedings, that the rules of the computing industry change so fast that, by the time a judgment or settlement is finally reached, its terms will have been rendered obsolete by the very evolution of the industry. Microsoft is actively working to demonstrate this principle, and we must see .NET not only as a good idea, but a warning. As long as we consider Microsoft the de facto keeper of the computing dictionary, we will render that company of changing its terms–and to some extent, our lives as a result–on a whim. these provisions would immediately be rendered archaic. broken federal and state laws. Microsoft has attained the freedom to dictate not only the terms of the course of action for others in that industry, but also the very terminology, principles, and rules of existence by which that industry operates. In 1984, an operating system was a “bootstrap” program whose basic function was to engage the computer, take keyboard commands from the user, and give the user some rudimentary access to stored files. In 2001, the operating system has become something which removes red-eye from photographs, bounces instant messages to digital cell phones, and handles copyright infringement management on behalf of music publishers–and all of these things, not particularly very well. This transfiguration of the concept of the operating system is referred to by Microsoft as “innovation.” No similar concept of innovation can be applied to any other industry in the world. In our own fantasy world, we can imagine an automobile industry whose leader endows its products with microwave ovens, paper shredders, and Spanish teachers. We can imagine the manufacturer calling these developments “innovation.” And we can argue that such developments would not be illegal in and of themselves. But even in that fantasy world, we cannot concoct a situation where the inclusion of these features in automobiles would in any way impede, hinder, or prohibit a consumer’s means of nuking a hot dog, shredding a letter, or counting to diez by any other method. its partnership and offers its own “innovation” as a substitute. prominence in a fair and competitive manner. deemed impossible given the laws of physics. tails of Enron’s bookkeeping strategy? just barely eking out our everyday jobs. four-dimensional puzzle from which rational minds can barely escape. knowingly deceived, is no remedy at all. death spiral, but to make him live with his own choices. Microsoft whatsoever just to stay alive. companies don’t want future agreements with Microsoft. every day–was designed, planned, built, and executed in bad faith. from Canada, from the EU, and elsewhere. display buttons and present menus. competition will determine which package is superior. equals. It can elect to play along, or go home and sulk. ”“Get me into that,” Bill Gates is quoted as saying, “and goddam, we’ll make so much money!”““Get me into that,” Bill Gates is quoted as saying, “and goddam, we’ll make so much money!” The free flow of transportation was engineered by geniuses–Henry Ford, John A. Roebling, Norman Bel Geddes–and championed by presidents–Abraham Lincoln, Theodore Roosevelt, Dwight Eisenhower. The free flow of ideas is one of the basic principles upheld by the United States Constitution. Up to now, all successful freedom has been constructed and established on solid principles. Are we truly prepared to draw up a statement that speaks for all of us as a people and a nation, that serves as a catalyst for the surrender of the free flow of information not to an institution defined by principles, but a corporation defined by deception? power. Spell out the law. And don’t get kicked in yourself. to obtain a final order that is agreeable to Microsoft. only remedy, we make the following observations. to undermine the free software movement. We also find the agreement wanting in several other areas. open to undue influence from Microsoft. important rival to Microsoft in the server market. operating-system chief Jim Allchin said this week. property rights . . .
and Stephen Shankland in CNET.com, June 18, 2001.
concludes in a forthcoming report. based Wirestone, a technology services company. core, or kernel, must also be governed by the GPL. the future of research and development. continues to hike up its prices for its monopoly products. the term of the agreement and the enforcement mechanisms. modify its strategy of anticompetitive abuses. incentive to abide by the agreement. middleware products that it illegally acted to sabotage. oversight body tasked with monitoring future misdeeds only. monopoly juggernaut a sterner message. Chicago Sun Times, June 1, 2001. The following is an expired page which comes as a public message from Nader. Microsoft has performed an illegal function and should be shut down. AS THE TITANIC antitrust case against Microsoft moves into its endgame, the question of the hour is what remedies will be effective in taming this wealthy and ruthless monopoly. The goal of any set of remedies should be to ensure that there will, in fact, be innovation, competition, and reasonable prices in some of the most important sectors of our economy: software, computers, and telecommunications. - Free PC manufacturers from Microsoft’s grip. Microsoft has used its monopoly power to bully original equipment manufacturers into installing only Windows on computers. A court-ordered remedy of nondiscriminatory OEM licensing of Windows would go a long way toward solving this problem. Pricing and licensing should be “transparent,” openly published, and evenhandedly applied. - Don’t let Microsoft use its other software monopolies to limit competition. Just as Microsoft used its Windows monopoly to threaten the competition, so it is using its Office franchise to scare off competitors and dominate new Internet markets. Its preferred strategy is the notorious “embrace, extend, and extinguish” gambit: embrace the new Internet authoring tools as part of the dominant Office software suite; extend control of the new market by introducing proprietary standards that are incompatible with competitors’; extinguish competing software through manipulative licensing and bundling deals with OEMs. The court should require Microsoft to separate Microsoft Office from Windows, and the new owner of Office should be required to port the entire platform to multiple non-Windows operating systems. - Ensure that “Internet navigation” options remain open. Microsoft has insisted to OEMs that it retain control of the “first screen,” or default choices for Internet navigation menus. It has done so to retain control over the time and attention of computer users, whose reliance on the default “first screen” can be used to channel them to certain e-commerce sites. Here’s the danger: if any single firm exercises too much control over Internet navigation, competition in e-commerce markets will suffer. Microsoft should be prohibited from imposing such terms. - Protect interoperability of hardware, software, and network protocols. The usefulness of software programs depends on their ability to work (and coexist) with other software programs, with hardware systems, and with the protocols of telecommunications networks. It should come as no surprise that Microsoft frequently and deliberately introduces barriers to compatibility and interoperability, preventing competitors from working with Microsoft’s monopolizing Windows or Office products. One remedy is to force Microsoft to support open standards for software and to provide extensive technical information in a timely manner and in usable formats and protocols to any company that requests it. - Adopt structural remedies, because the past six years of antitrust problems with Microsoft have demonstrated that the company cannot be trusted. Its conduct during the trial itself offers the best evidence of this point. The company subverted the intent if not the language of a 1995 consent order, by integrating its browser into the Windows operating system. Effective remedies should, as much as possible, avoid “conduct remedies” that require continuing court oversight. Ideally, a breakup of the company would go further than the Justice Department proposal to divide the operating system line of business from the application and other lines of business. The court could insist that Microsoft separate the Internet Explorer browser from Microsoft Office. That way, the browser market could become competitive again and the owner of Microsoft Office would find a way to function with more than one browser. This would be an important result in a world where the browser is key in setting Web publishing standards and links to e-commerce sites and where Microsoft is driving for dominance in Internet authoring tools. The court should also consider forcing Microsoft to spin off, as a separate company, all of its online services and minority interests in networking companies. There is no legitimate tie between the software businesses and online/network services – only anticompetitive mischief. The antitrust remedies that ultimately bring the marauding Microsoft to heel will have far-reaching consequences – on future software design and choices, on consumer prices, on the competitiveness of e-commerce, on the very structure of the Internet and hence our culture. The factual case against Microsoft has been made devastatingly clear. If Microsoft’s long record of deception and untrustworthiness is to be ended, the public remedies must be as bold, sweeping, and effective as the company’s private power. Does Internet Explorer 8 Have a Web Hijack Plan in Store? If So, Does Novell Help It?